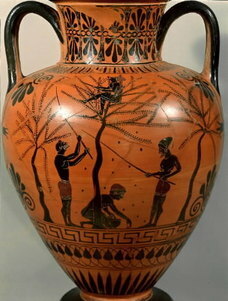 Tetradracma ateniese del V secolo BC in argento con l'effigie di Athena e, sul recto, i suoi semboli: il ramoscello di olivo e la civetta. robuste porte ci misi, saldamente commesse. ne lavorai un sostegno e tutto lo trivellai con il trapano. ornandolo d’oro, d’argento e d’avorio. Per ultimo tirai le corregge di cuoio, splendenti di porpora. qualcuno l’ha mosso, tagliando di sotto il piede d’olivo”. gettò attorno al collo a odisseo e gli baciò il capo. Columella – De Re Rustica. There is an almost mystic bond between humanity and the olive tree. In all civilizations born around the Mediterranean, the olive tree has always been considered a sacred tree and the oil extracted from its fruits has been used not only as food, but also for religious purposes , rituals, initiations , cleaning, and for lighting . It is a bond that is intertwined, also symbolically, with the beginning of the life of civilization: the olive tree branch in the beak of the dove announced the renewal of human history after the flood in the Bible story, representing life and hope. Zeus entrusted the city of Athens and Attica to Athena who brought the gift of an olive tree, which was preferred to the beautiful horse donated by Poseidon. Hercules, carried the seed to plant the olive tree from the Hyperboreans at the foot of Mount Olympus : and wreaths of olive branches were used to crown the winners of the Olympics. For the ancient Egyptians, the olive tree was considered as a gift from the gods. The Jews used the oil to "anoint" their kings in the Old Testament and it was considered a divine blessing , a bond between man and God and between death and life. The merchant ships of the Phoenicians and Greeks spread the use of this "liquid gold" along their trade routes in the Mediterranean. Christianity gathered this heritage into its new religion and the sacred value of olives and olive oil was not lost. The oil united man to the divine Messiah in Hebrew and Kristos in Greek means the Anointed One.